an electric switch in which the opening and closing of contacts and extinguishing of the electric arc are accomplished by means of compressed air. The air pressure in an air-break switch ranges from 0.4 to 6 meganewtons per sq m (MN/m2), or 4 to 60 atmospheres (atm); the most widely used pressures are 1.6 to 4 MN/m2 (16 to 40 atm). An air-break switch consists of three basic structural elements: a reservoir with a supply of compressed air, an arc extinguisher, and an electropneumatic actuator. In air-break switches for currents of up to 35 kV, including earlier units designed for currents of 110 kV and higher, the arc extinguisher is located outside the compressed-air reservoir and is connected to it by an insulated air line. 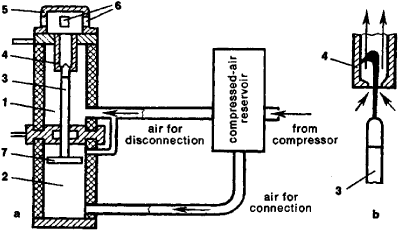 A schematic diagram of such an air-break switch is shown in Figure 1. When the electromagnet (3) is de-energized, the air-blast valve (2) for supplying compressed air from the reservoir (1) through the air line (4) to the arc blowout chamber (5) is opened through a system of pneumatic devices. The com-pressed air, acting on the pistons (6) of the movable contacts (7), forces them away from the fixed contacts (8) (as shown conventionally for the upper circuit). When the contacts (7) and (8) open, an arc is formed; it is extinguished by the stream of compressed air being directed from the chamber (5) through the outlets (nozzles) of the contacts (7) and (8) to the gas-escape channels (9), which vent to the atmosphere. After a short time delay, the compressed air enters the cylinder of the pneumatic actuator (10) and, actuating the piston (11), breaks the contacts (12) and (13) of the isolating switch after the arc has already been extinguished. 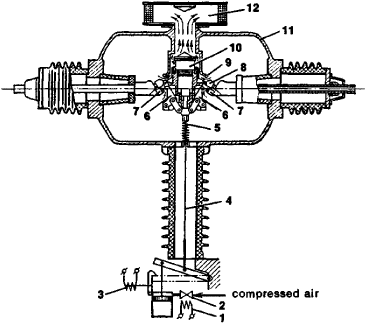 After this, a valve (2) cuts off the incoming compressed air, and contacts (7) and (8) are closed. When the electromagnet (16) is energized, it opens valve (15), and the compressed air passes through the insulated air line (14) and enters the cylinder (10), where it closes the isolating switch contacts by acting on the piston (11). Modern air-break switches are provided with an enclosed isolating switch whose contacts are housed in an insulated casing that fills with compressed air upon disconnection (Figure 2). Air-break switches at currents of 110 kV and higher (up to 750 kV) are manufactured with air-filled isolating switches. Figure 1. Schematic diagram of an air-break switch for currents up to 35 kV: (1) compressed-air reservoir, (2) air-blast valve, (3) electromagnet, (4) air line, (5) arc blowout chamber, (6) pistons, (7) and (8) contacts, (9) gas-escape channels, (10) cylinder, (11) piston, (12) and (13) isolating switch contacts, (14) air line (15) valve, (16) electromagnet. In air-break switches at currents above 35 kV, the arc extinguisher and its contacts are mounted directly in the compressed-air reservoir (Figure 3), which creates the necessary electric strength between the open contacts. An arc develops between the movable contacts (6) and the fixed contacts (7) when their circuits are broken. At the same time, the valve (10) opens and the compressed air leaves the reservoir (11) and passes through the nozzles (9) and the gas-escape channel (12). The arc is blown off to the arc-detector electrodes (8) by the stream of compressed air and is extinguished. 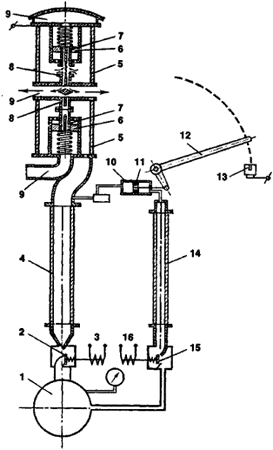 The valve (10) closes and prevents the compressed air from discharging into the atmosphere. Figure 2. Air-break switch with enclosed isolating switch for currents above 110 kV: (a) schematic diagram of air-break switch; (b) diagram of extinguishing of arc: (1) arc blowout chamber, (2) actuator cylinder, (3) movable contacts, (4) stationary contacts, (5) cap, (6) cap vents, (7) piston. Figure 3. Schematic diagram of air-break switch with enclosed isolating switch: (1) electromagnet for connection, (2) compressed-air flow valve, (3) electromagnet for disconnection, (4) insulated rod (pin), (5) spring, (6) movable contacts, (7) fixed contacts, (8) arc-detector electrodes, (9) nozzle, (10) release valve, (11) reservoir, (12) gas-escape channel. voltages from 110 to 250 kV with one module. Circuit breakers for greater voltages consist of several simultaneously acting modules connected in series. The modules are shunted by capacitors for uniform voltage distribution between open circuits in the disconnected position. The principal advantages of air-break switches lie in the fact that they are fireproof and explosionproof, have rapid connect and disconnect operation, and are relatively simple in design. The presence of equipment for the production and storage of compressed-air supplies is a disadvantage. Air-break switches at currents up to 750 kV, which are generally used at high-voltage power plants and substations, are manufactured in the USSR. Tseirov, E. M. Vozdushnye vykliuchateli vysokogo napriazheniia. Moscow-Leningrad, 1957. Sostoianie i razvitie vykliuchaiushchei apparatury peremennogo toka vysokogo napriazheniia. Moscow, 1960. Afanas’ev, V. V. Vozdushnye vykliuchateli. Moscow-Leningrad, 1964. Puzyriiskii, G. S. “Vozdushnye vykliuchateli vysokogo napriazheniia.” In Itogi nauki i tekhniki: Elektricheskie mashiny i apparaty. Moscow, 1966.